In partnership with New Life Society, the Motor Avenue Farmers Market & Urban Garden Program feeds the hungry. Every week, our California Certified farmers donate fresh fruits and vegetables to those who need it. ﻿New Life Society’s objective is to provide food, shelter, nurturing and employment for persons experiencing urban proverty. We particularly notice and seek to aid veterans, both men and women, who have given their energy to serve this country. Their contributions deserve unending support, for their courage and selflessness. We strive to find ways and means to give a helping hand in these troubled times. With your help, our success is guaranteed, and this world SHALL become a better place to live; one child, one man, and one woman at a time. 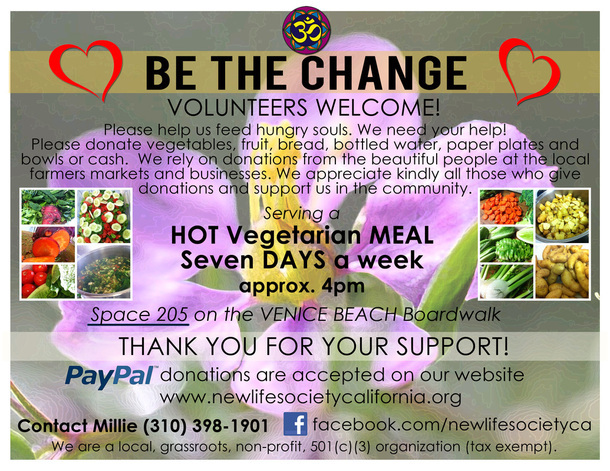 We feed the hungry almost everyday on the Venice Beach boardwalk. Meals consist of a generous portion of organic salad and fresh, baked bread with varying extras i.e. simmered herb potatoes, fruit, etc. depending upon season and availability. All food is by kind-hearted donation from local farmers markets. Want to get more invol﻿ved? 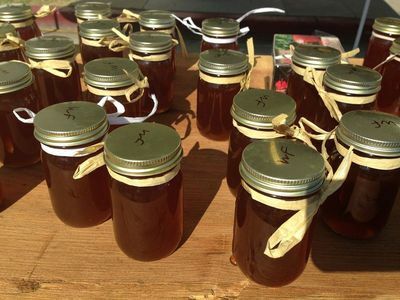 In addition to political action you can do your own part by calling your local Bee Rescue Service that will relocate the bees to a safe farm where they can make all natural honey for you and me!